Attention animation fans! 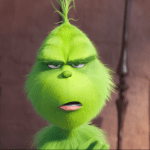 We have a new trailer for Illumination’s upcoming film, The Grinch.This film is set to open on November 9th in US theaters and has the voice talents of Benedict Cumberbatch in the lead role. The trailer follows our mean old Grinch as he wakes up, orders his dog around, and stomps around the local grocery store. Perhaps my expectations were exceedingly low, but I thought this trailer was okay. It didn’t blow me away, but I didn’t hate it. I am extremely skeptical of another attempt by Illumination to take on Seuss after the disaster of The Lorax, but just as a trailer it was fine. The animation was fine. The voice-work sounds fine from Cumberbatch. It reminded me of The Angry Birds Movie trailers, which were fine. The problem with Seuss adaptations is there just isn’t enough meat on their bones for a two-hour feature so they have to puff it up with new storylines that are usually awful. The closest anyone has come to making it work is Blue Sky’s Horton Hears a Who and that’s only marginally passable. I am not a fan of Ron Howard’s Grinch film, so I am hopeful this will be at least better than that effort. Some have pointed out the similarity of this trailer to Despicable Me, which is a valid point. If the movie can be executed as competently as that film, then I will be satisfied. I at least didn’t see any minion-like characters, so that is a relief. What do you think of this trailer? Did you love it, hate it, or are you like me and thought it was okay? Let us know in the comments below!